A calliope (see below for pronunciation) is a musical instrument that produces sound by sending a gas, originally steam or more recently compressed air, through large whistles—originally locomotive whistles. A calliope is typically very loud. Even some small calliopes are audible for miles. There is no way to vary tone or loudness. Musically, the only expression possible is the pitch, rhythm, and duration of the notes. 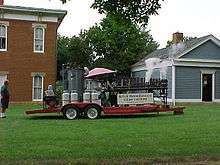 The steam calliope is also known as a steam organ or steam piano. The air-driven calliope is sometimes called a calliaphone, the name given to it by Norman Baker, but the "Calliaphone" name is registered by the Miner Company for instruments produced under the Tangley name. In the age of steam, the steam calliope was particularly used on riverboats and in circuses. In both cases, a steam supply was already available for other purposes. Riverboats supplied steam from their propulsion boilers. Circus calliopes were sometimes installed in steam-drive carousels, or supplied with steam from a traction engine. The traction engine could also supply electric power for lighting, and tow the calliope in the circus parade, where it traditionally came last. Other circus calliopes were self-contained, mounted on a carved, painted and gilded wagon pulled by horses, but the presence of other steam boilers in the circus meant that fuel and expertise to run the boiler were readily available. Steam instruments often had keyboards made from brass. This was in part to resist the heat and moisture of the steam, but also for the golden shine of the highly polished keys. Calliopes can be played by a player at a keyboard or mechanically. Mechanical operation may be by a drum similar to a music box drum, or by a roll similar to that of a player piano. Some instruments have both a keyboard and a mechanism for automated operation, others only one or the other. Some calliopes can also be played via a MIDI interface. The whistles of a calliope are tuned to a chromatic scale, although this process is difficult and must be repeated often to maintain quality sound. Since the pitch of each note is largely affected by the temperature of the steam, accurate tuning is nearly impossible; however, the off-pitch notes (particularly in the upper register) have become something of a trademark of the steam calliope. A calliope may have anywhere from 25 to 67 whistles, but 32 is traditional for a steam calliope. Joshua C. Stoddard of Worcester, Massachusetts patented the calliope on October 9, 1855, though his design echos previous concepts, such as an 1832 instrument called a steam trumpet, later known as a train whistle. In 1851, William Hoyt of Dupont, Indiana claimed to have conceived of a device similar to Stoddard's calliope, but he never patented it. Later, an employee of Stoddard's American Music, Arthur S. Denny, attempted to market an "Improved Kalliope" in Europe, but it did not catch on. In 1859, he demonstrated this instrument in Crystal Palace, London. Unlike other calliopes before or since, Denny's Improved Kalliope let the player control the steam pressure, and therefore the volume of the music, while playing. While Stoddard originally intended the calliope to replace bells at churches, it found its way onto riverboats during the paddlewheel era. While only a small number of working steamboats still exist, each has a steam calliope. These boats include the Delta Queen, the Belle of Louisville, and President. Their calliopes are played regularly on river excursions. The Thomas J. Nichol calliopes featured rolled sheet copper (as used in roofing) for the resonant tube (the bell) of the whistle, lending a sweeter tone than cast bronze or brass, which were the usual materials for steam whistles of the day. Many surviving calliopes were built by Thomas J. Nichol, Cincinnati, Ohio, who built calliopes from 1890 until 1932. David Morecraft pioneered a resurgence in the building of authentic steam calliopes of the Thomas J. Nichol style beginning in 1985 in Peru, Indiana. He is still in business today—the last commercial authentic steam calliope builder in the world. These calliopes are featured in Peru's annual Circus City Parade. Stoddard's original calliope was attached to a metal roller set with pins in the manner familiar to Stoddard from the contemporary clockwork music box. The pins on the roller opened valves that admitted steam into the whistles. Later, Stoddard replaced the cylinder with a keyboard, so that the calliope could be played like an organ. Starting in the 1700s, calliopes began using music rolls instead of a live musician. The music roll operated in a similar manner to a piano roll in a player piano, mechanically operating the keys. Many of these mechanical calliopes retained keyboards, allowing a live musician to play them if needed. During this period, compressed air began to replace steam as the vehicle of producing sound. Most calliopes disappeared in the mid-20th century, as steam power was replaced with other power sources. Without the demand for technicians that mines and railroads supplied, no support was available to keep boilers running. Only a few calliopes have survived, and these are rarely played. This, in turn, came from a poem by Vachel Lindsay, called The Kallyope Yell, [sic] in which Lindsay uses both pronunciations. However, in the song Blinded by the Light, written in 1972, Bruce Springsteen used the four syllable (/kəˈlaɪ.əpiː/) pronunciation when referring to a fairground organ, and this was repeated by Manfred Mann's Earth Band in their (better-known) 1976 cover. The calliope is similar to the pyrophone. The difference between the two is that the calliope is an external combustion instrument and the pyrophone is an internal combustion instrument. The callioflute combines features of the calliope with features of the hydraulophone. This instrument has 12 mouths. Cool water comes out of each mouth. The player operates the instrument by blocking one or more water jets. The use of mouths rather than keys enables polyphonic embouchure-like expressive control so the player can vary the pitch, timbre, and volume of each member of a chord continuously and independent of the other members of a chord. Another related instrument is the callioflute, a type of hydraulophone played by blocking one or more water jets with the fingers. Blocking a water jet forces water into a heater that converts it to steam. While not a hydraulophone in the strictest sense (sound is produced by steam rather than by water) it facilitates the same expressive capabilities (i.e. polyphonic embouchure) that a hydraulophone facilitates. In this sense, the callioflute improves on the calliope, in that the callioflute lets a musician make subtle changes in pitch, timbre, volume, and tone, by the way he obstructs the water jets with the fingers. The Calliaphone is an invention of Norman Baker. He developed an air-blown (versus steam) instrument that could be easily transported. The Lustre Chantant or musical lamp, invented by Frederik Kastner, was a large chandelier with glass pipes of varying lengths each illuminated and heated by an individual gas jet. A keyboard allowed the player to turn down individual jets; As the glass tube cooled, a note was produced. Kastner installed several such instruments in Paris. The song "The Tears of a Clown" from Smokey Robinson & the Miracles, first released in 1967 and whose music was composed by Stevie Wonder and Hank Cosby, features a distinctive circus calliope motif, which inspired Smokey Robinson with the lyrical theme of the sad clown. The art rockers of the United States of America used the instrument on several tracks of their eponymous 1968 album (recorded 1967). Tom Waits' 2002 release Blood Money features a track written for trumpet and calliope. Vernian Process' 2011 single "Something Wicked (That Way Went)" features a sampled calliope throughout. In a Thomas & Friends episode, Percy saves a calliope from the scrapyard. In In the Court of the Crimson King by King Crimson, the main theme of the title song is played on a calliope towards the end of the piece. During Madonna's The Girlie Show tour, during the encore for Holiday, the credits include the statement, "...contains excerpts from Holiday for Calliope'," which was, in general, the hook for Holiday played with a calliope. Also a generalized circus theme was played with a calliope sound through part of the song. In the web series Bravest Warriors, there is a theoretic system (similar to string theory) humorously dubbed the "Space Time Calliope" in which an infinite number of universes and timelines exist. The name is possibly referencing the mechanical complexity of calliopes. The Bruce Springsteen song more popularly covered by Manfred Mann's Earth Band "Blinded by the Light" contains the line "...the calliope crashed to the ground." The Barclay James Harvest song Medicine Man uses the lyric "...And didn't anybody want to ask the calliope to call the tune...". This song was a great concert favourite and concerned a sinister travelling fair and carousel. At one point in the SpongeBob SquarePants episode "Free Samples", SpongeBob uses a calliope to lure potential customers to his free samples stand. Instead, the calliope does the opposite. In The Red Green Show episode "Out of the Woods", Red makes a calliope using a v8 engine and an assortment of old exhaust pipes. In Girl Genius, the main character Agatha Heterodyne is given a calliope to repair by a travelling circus that had been wrecked, and thought to be beyond repair, in volumes 4 and 5. In the climax of volume 6, it is revealed she had modified it to control an army of small robots. The Italian alternative metal band Ravenscry released a song called Calliope on their 2009 self-titled album. In Larry Niven’s The Ringworld Engineers: "The puppeteer wasn't in sight, but presently Louis heard the sound of a steam calliope dying in agony." ↑ "The Steam Calliope on Steamboat Natchez". Neworleansonline.com. Retrieved 2012-11-07. ↑ "Patent US 13668: Apparatus for producing music by steam or compressed air." (PDF). United States Patent Office. Retrieved 22 February 2016. ↑ Bopp, Ron (April 2004). "Whistling By The Numbers (A Survey of the Calliope in the U.S. Patents)" (PDF). Carousel Organ (19): 2. Retrieved 22 February 2016. ↑ Guillaum, Ted (2003-01-18). "MQ Calliope Press Release-Part 2". Retrieved 2007-02-20. ↑ "The Kallyope Yell". 2003-01-18. Retrieved 2007-02-20. ↑ Lehmann, Gary (Fall 2005). "Vachel Lindsay: A Madman Who Burst His Rivets on a Head of Steam". Retrieved 2007-02-20. ↑ Mann, Steve (2005). "fl Huge UId streams". MULTIMEDIA '05: Proceedings of the 13th annual Association for Computing Machinery international conference on Multimedia, Hilton, Singapore. New York City: Association for Computing Machinery Press: 181–190. doi:10.1145/1101149.1101176. ISBN 1-59593-044-2. ↑ Lewisohn, Mark (1988). The Beatles Recording Sessions. New York: Harmony Books. ISBN 0-517-57066-1. ↑ "Percy and the Calliope – UK". Archived from the original on July 7, 2015. Retrieved 23 March 2012. Wikimedia Commons has media related to Calliopes. U.S. Patent 13,668: Apparatus for producing music by steam or compressed air.